Sun shining on an empty Japanese classroom. Gloria Jean Merriex grew up in Gainesville, Florida. Gainesville is a city of extremes; on the one hand, it's the home of the University of Florida and has many of the features of a big college town; on the other hand, the southern and eastern neighborhoods of Gainesboro are home to crushing poverty. Charles Duval Elementary School is located in the center of an eastern neighborhood filled with crime and poverty. Merriex saw teaching as a path out of the poverty of her neighborhood, but she did not choose to leave the neighborhood itself. 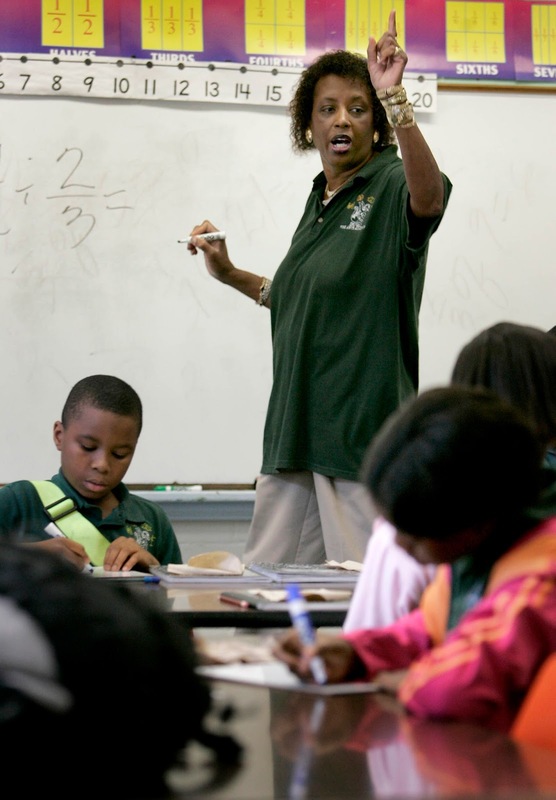 Once she had her degree, she chose to teach at Duval Elementary, where for about twenty-five years she was a middle-of-the-road, competent-but-not-exceptional teacher. I became acquainted with Merriex through the work of filmmaker Boaz Dvir; my nephew, who studied film at Penn State, had Dvir as a teacher and thought we might have a few things to say to each other. But years ago, Dvir was a professor in Florida who heard about Merriex and decided to tell her story. The result is a documentary in progress entitled "Discovering Gloria." I've watched a rough cut of the film, and it is a challenging and moving story. The story, of course, is not about the first twenty-five years of Merriex's career. The story really starts with Florida's reform efforts, Florida's Big Standardized Test (FCAT), and Florida's assignment of letter grades to schools, back in the days when No Child Left Behind was the hot, new thing. Duval scored a big fat F, and Merriex was troubled. Couldn't-sleep-at-night troubled. The school having "failed," the state stepped in with strict pacing guides and mandated materials so that the school would be working toward Meeting the Standards. Meanwhile, Merriex faced the realization that she could not keep teaching as she had. It was a transformative moment for her, not just as a teacher, but as a person. She began to think about what she really had to do. She dumped the state pacing guides and teaching materials. When she got caught, she begged Duval principal Lee McNealy for a chance to give her methods a try, and McNealy had the guts and trust to give it to her. So Merriex developed materials and approaches of her own, and for the early 2000s, her choices were a bit out there. She wrote raps and dances to do with her students for learning math vocabulary and basic processes. She used call and response in the classroom. She was stern and demanding in a classic sense, but she did constant outreach and made family connections in the modern teacher-counselor sense. She visited homes, saw to students' non-academic needs, provided instruction to entire families. Cooked classroom meals. mended school uniforms. Held Saturday classes for FCAT prep. She refined and reflected, developed and grew more materials. Duval became a miracle school, getting spectacular test results. Duval scored A after A, Merriex's students posting the greatest test score gains in the state. The school was filled with pride, the students confident and accomplished. Duval-- and Merriex-- became one of Florida's great success stories. Merriex created a math team, a group of students who toured and demonstrated their math rap and math skills. Merriex herself was in increasing demand, speaking and demonstrating her techniques for teachers and administrators from all across the state and country. Merriex's story defies simple categorization. There is frankly much here that reformsters will like. The letter grade system shocked Merriex and her school out of their old ways. And once it was clear that Merriex was on to something, Duval's administration packed her classroom, having her teach forty or fifty students at a time. And the rough cut of Dvir's film tells the story of a student previously labeled learning disabled who blossoms and succeeds under Merriex's tutelage, an apparent confirmation of the "replace special ed with high expectations" reformster camp. At the same time, reformsters should also note that Merriex completely dismantled and dismissed the state plan for how the courses should be taught. The pacing guide? Out the window. Dvir talks to one of the many academics who came to watch Merriex to try to figure out what she was doing; one striking feature was that Meriex would work completely out of the "normal" sequence and jump from one math subject to another in ways that defied conventional approaches. Yet somehow they worked. Merriex met her students where they were, creating her materials to match their own concerns and interests. Her techniques defied "scaling up" because they were developed for the children of that neighborhood-- a neighborhood that she had known her whole life. It would never be possible to take five weeks to teach a bunch of college kids the Merriex Method and send them out into schools all across the nation in communities that they've never set foot in before. Merriex's techniques were custom made for students in that community by a lifelong member of that community. Nevertheless, the Lastinger Center for Learning at the University of Florida decided to study her, even mounting cameras in her classroom intending to stream her lessons around the world. And the Kellogg Foundation-- one of the great reformster money-spreaders-- awarded the center grants to help fund the study. But Kellogg went one better-- in May of 2008, they awarded Merriex a grant to develop a national math curriculum. Merriex appeared to be living proof of concept for the Hero Teacher. On the day after the awarding of the Kellogg grant, Merriex suffered a diabetic stroke. She died at the age of 58. It is hard not to conclude that in order to be a Hero Teacher, Merriex had worked herself to death. Although I received a grant from Kellogg., I've had 100 percent editorial and creative control. I never had even one conversation with Kellogg about the making of the film. I interviewed a Kellogg rep as part of the filming process, but he never asked me about what I was doing. He simply answered my questions. I've never even screened the rough cut for Kellogg! As I said, I've had complete editorial and creative control over this film - as I have and continue to have on all my films. I'm as strict as any documentary filmmakers get about this. Part of it is my journalistic DNA. Another part is that I do this work purely for scholarship and making a difference. I've talked to him (and I trust my nephew as a judge of character) and I see the documentary as objective and journalistic in character. I don't smell reformy agenda here. As I suggested above, I think reformsters may rush to learn the wrong lessons from this story-- that you just need to find a super-teacher and clone her, that BS Tests are great for measuring and fixing education (a premise that everyone in the film accepts and nobody actually challenges), that if you just believe and try real hard then poverty and race don't really matter. But I think there are far more important lessons to be learned from Merriex's story. One is the power of administration to protect teachers from bad state and federal policy. Merriex's story of transformation and achievement would never have happened if, in the very beginning, her principal had said, "Dammit, no. We scored an F, so there will be no experimenting. You get back in that classroom and follow the pacing guide the state sent us, and you follow it to the letter." But Merriex's principal trusted her, trusted her professional judgment, and trusted her commitment to her students, and so that principal let Gloria Jean Merriex do her thing. It was easy for everyone to fall in behind Merriex after the fact, and therefor it's easy to forget that Merriex and her principal were risking their careers and bucking the district, the state and the feds. Another lesson is the limits of the administrative power-- the school still had to face having its success measured by the BS Test and a single letter grade. Another lesson is the value of community connection. Merriex could figure out what needed to be done because she was of that community, in that community. She knew the language, the values, the streets and neighborhoods, the families. It mattered that she grew up there as a young black girl, to become a teacher in a 99% black school. All the fresh-scrubbed ivy league honor roll graduates in the world could not substitute for what Merriex knew by being of her community. There's a moment (it's also in the trailer) where Merriex's former principal tells the story of letting the teacher know that the school received an F and she appears to almost says "She just turned white" and then catches herself. If you like extra-close readings of moments, it's a resonant moment because if Gloria Jean Merriex had turned white, her success would never happen. If anything, Merriex achieved success in that school by turning less white, by more fully rejecting what the classically white education system told her she was supposed to do and by more fully embracing the culture of her community. Also-- sitting each of those students down with a computer to work on their interactive adaptive education software would also have failed as a substitute for Merriex. That points to another huge lesson- while reformsters may say, "Look, high standards and hard work erased the effects of poverty," that overlooks the fact that for Merriex, offsetting the effects of poverty was a second full-time job on top of her teaching job. Working with families, providing concrete support for students, providing emotional support for students and families and co-workers-- Merriex was doing all those non-teaching duties with every spare hour she had so that her actual teaching would have a chance of actually being effective. And ultimately, her second full time job of offsetting the effects of poverty required everything she had. To say that Merriex overcame the effects of poverty "just" with high standards and high expectations would be a lie. I found it humbling to watch her story, to realize that while I can talk about dedicating my life to teaching, I don't mean anything like what Gloria Jean Merriex meant. I've written about the limits of what we can do as teachers, and most of us who teach are aware of those limits, but few of us push ourselves as close to (or over) those limits like Merriex did. I will be sure to let you know when the completed film is finally released. In the meantime, here's the trailer for what is, for better or worse, a teacher story for the new millennium. Discovering Gloria Trailer from Boaz Dvir on Vimeo.